So far in my on-line training, I’ve learned a LOT about forklift safety and the Stability Triangle, which now that I think about it has a lot to do with safety as well- so it’s safe to say at this point that the on-line portion of the training is very much about not getting you or your co-workers hurt. It’s time well-spent. The next section involves inspection and maintenance and there’s a heavy dose of common sense in here as well. It starts the way every shift should start- with the visual inspection. Around the tires, inside the mast, check the safety apparatus (horn, emergency brake, seat belt, reverse alarm, gauges, etc) and make sure the forklift is properly lubricated and that there is no new damage from the operator before you. There’s more, but you’ll have to take the course yourself to find out about the extras. This, it is made very clear, should be performed at the beginning of every shift. The quiz at the end of this section has ten questions, all multiple choice, and if you use common sense you can get through it quickly. I scored ten out of ten on this quiz and was ready to look at my overall on-line performance. It took me a little more than two hours over a few days to get through the entire on-line element of the training. There are 44 quiz questions in all and I nailed it, scoring 44/44. 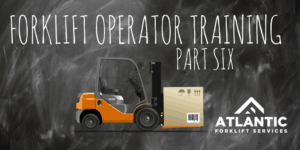 I don’t say that to brag, I only say that to emphasize that I came in with very little knowledge about forklifts and after taking the course I was able to answer all the questions correctly on the first go-around. 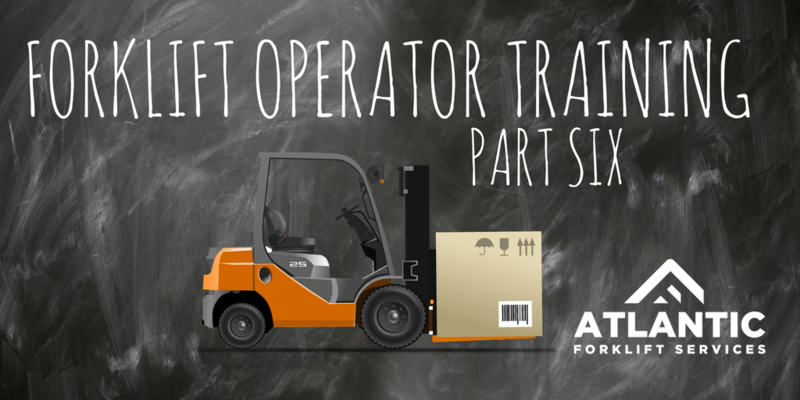 Anyone with any forklift knowledge and common sense should be able to absorb the information here and pass the quizzes easily. After submitting this to the powers-that-be, I was told I am ready to get behind the wheel of a forklift- and the truth is, armed with the practical knowledge and the theory behind handling a load, I do feel ready. If I can do this, you can. Contact us and we can get you started.